His Highness Sheikh Mohammed bin Rashid Al Maktoum, Vice President and Prime Minister of UAE and Ruler of Dubai, received this afternoon at Zabeel Palace, Valentina Matviyenko, Speaker of the Federation Council of the Federal Assembly of the Russian Federation, and her accompanying delegation..
Sheikh Hamdan bin Mohammed bin Rashid Al Maktoum, Crown Prince of Dubai, and Sheikh Maktoum bin Mohammed bin Rashid Al Maktoum, Deputy Ruler of Dubai, were also present. Sheikh Mohammed welcomed the guest and expressed his happiness at meeting and discussing with her the historical ties of friendship between the UAE and Russia. 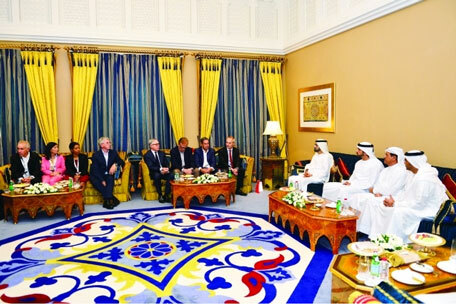 Sheikh Mohammed indicated the importance of communication and exchanging visits between officials of both countries to co-ordinate and hold continuous discussions regarding bilateral, regional and international issues of mutual interest, especially those related to international peace, and which achieve stability and justice for peoples across the world away from using force. The Speaker of the Federation Council of the Federal Assembly of the Russian Federation expressed her happiness to visit the UAE, her continuous meetings with its leaders and FNC Speaker, which enabled her to get acquainted with the culture of the people of the UAE and its wise leadership in its internal and external policies, that gives great importance to human resources which have made it a role model of sustainable human resources development. While discussing co-operation in the parliamentary, tourist, investment and other domains, she hailed Sheikh Mohammed's ideas and courage in making decisions in the best interests of his people and to develop the UAE's stature globally. She also pointed to the Emirates Airlines, the first national airline established by Sheikh Mohammed in 1985, which is now one of the largest and most famous airlines across the world. Matviyenko highlighted the cultural and developmental renaissance witnessed by the UAE in various avenues, especially in terms of infrastructure, which excelled in its specifications and efficiency of many of the infrastructure projects in the ancient countries. Among others present were Dr. Amal Abdullah Al Qubaisi, Speaker of the Federal National Council; Sheikh Ahmed bin Saeed Al Maktoum, President of Dubai Civil Aviation and Chief Executive of Emirates Group; Mohammed bin Abdullah Al Gergawi, Minister of Cabinet Affairs and The Future; Reem bint Ibrahim Al Hashemi, Minister of State for International Cooperation; Khalifa Saeed Suleiman, Director-General of the Protocol and Hospitality Department in Dubai, and Alexander Efimov, Ambassador Extraordinary and Plenipotentiary of the Russian Federation to the UAE. His Highness Sheikh Mohammed bin Rashid Al Maktoum, Vice President and Prime Minister and Ruler of Dubai met in the presence of Sheikh Hamdan bin Mohammed bin Rashid Al Maktoum, Crown Prince of Dubai, the 13 key speakers of the World Retail Congress which opened earlier on Wednesday in Dubai’s Madinat Jumeirah. The World Retail Congress is being organised by the Dubai Chamber of Commerce and industry (DCCI). Sheikh Mohammed welcomed the speakers, among them the chairpersons and CEOs of the world's leading retail companies. He expressed pleasure at holding this international gathering in the UAE. Sheikh Mohammed directed the Ministry of Economy and the DCCI to take further steps to increase the retail trade in the UAE, currently standing at AED 165 billion, of which, Dh130 billion is conducted in Dubai. The key speakers of the event said they were pleased to attend their 10th gathering in Dubai which, thanks to the policies and vision of Sheikh Mohammed bin Rashid Al Maktoum, has become a global hub for retail business. They also praised the cultural diversity in the UAE which has made it a pioneering destination for individual and family shopping, supported by the facilities offered to the visitors. The meeting was attended by Mohammad bin Abdullah Al Gergawi, Minister of Cabinet Affairs and the Future, Sultan bin Saeed Al Mansouri, Minister of Economy, Majid Saif Al Ghurair, Chairman of the DCCI, Hamad bu Amim, Director General of the DCCI and Khalifa Saeed Sulaiman, Director General of Dubai Protocol and Hospitality Department. In front of the His Highness Sheikh Mohammed bin Rashid Al Maktoum, UAE Vice President, Prime Minister and Ruler of Dubai, Justice Sir Jeremy Cooke has taken the oath on April 13, as he will assume the position of judge at the Court of First Instant and Court of Appeal in the Dubai International Financial Centre (DIFC) Courts. Sheikh Hamdan bin Mohammed bin Rashid Al Maktoum, Crown Prince of Dubai, and Sheikh Maktoum bin Mohammed bin Rashid Al Maktoum, Deputy Ruler of Dubai and President of DIFC, were also present at the ceremony that took place at Zabeel Palace. Reem bint Ibrahim Al Hashemi, Minister of State for International Cooperation; and Essa Kazim, governor of DIFC. His Highness, and in his capacity as a ruler of Dubai, issued a decree to appoint Justice Sir Jeremy Cooke, as an international judge at the DIFC Court, which includes 10 international judges, with 3 judges are UAE nationals. Sheikh Mohammed urged chief justice, who was among the present at the ceremony, and the new judge to handle every case with the utmost transparency and neutrality to protect the interest of investors “as per the law”. His Highness Sheikh Mohammed bin Rashid Al Maktoum, Vice President and Prime Minister of UAE and Ruler of Dubai, paid his condolences today to the family of deceased Mohammed Abdullah Al Qaz. Accompanied by Sheikh Hamdan bin Mohammed bin Rashid Al Maktoum, Crown Prince of Dubai and Khalifa Saeed Suleiman, Director-General of Protocol and Hospitality in Dubai, visited the mourning majlis in Al Hamriya district, Dubai. He offered his heartfelt condolences to the children of the deceased, and prayed to almighty Allah to rest his soul in eternal peace.